As a semi-automatic rifle, the M1 Garand has slightly different ammo requirements from the bolt-action guns widely used by hunters. Most .30-06 ammunition on the market today is designed for the stronger, slower-firing bolt-action system. 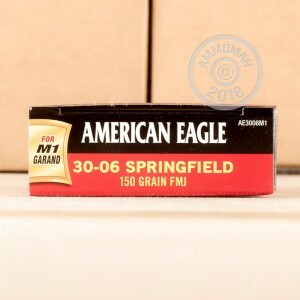 This ammo from Federal, on the other hand, features slightly lower pressures that will function reliably in an M1 without damaging its mechanisms. Despite these lower pressures, this ammo is no slouch when it comes to ballistics. 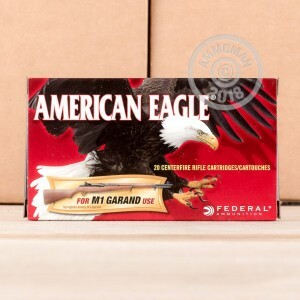 Each cartridge in this box of 20 fires a 150 grain full metal jacket bullet at about 2,740 feet per second, delivering excellent long-range accuracy worthy of the classic M1. 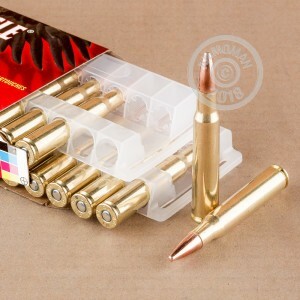 These cartridges use non-corrosive Boxer primers and brass cases. Buy a few boxes (or any items totaling $99 or more) to get free shipping from AmmoMan.com!